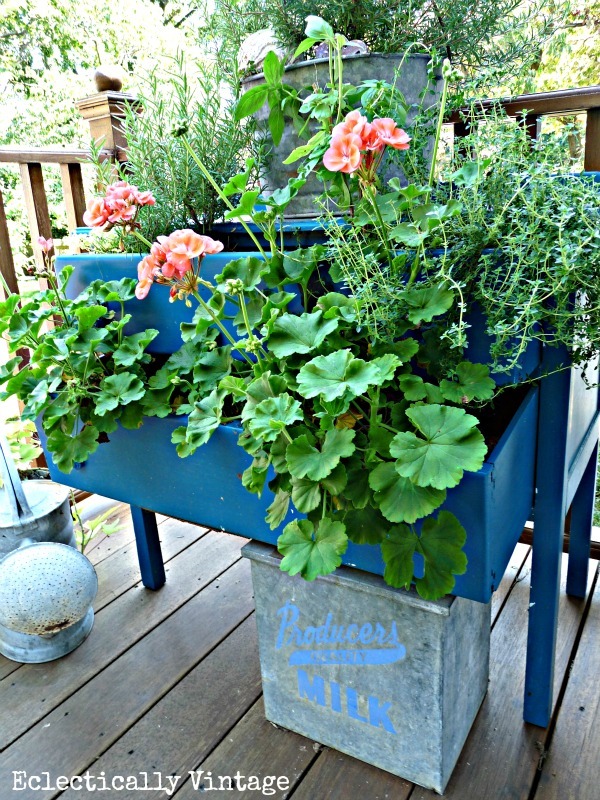 Dress Up Your Plants – in a Dresser! Talk about a bad hair day! All to get ready for our The Great Outdoors link party on Tuesday. Remember my $6 Thrift Shop Dresser Score? Well, she got a makeover – lip gloss, spanx and a shiny new tiara. and a chalkboard bird brooch. 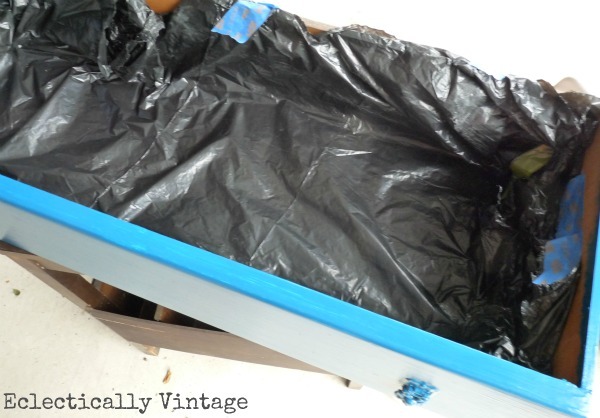 * Punch a few holes thru the garbage bags and bottom of drawers for drainage. * Put something heavy in the backs of the drawers (I used 3 bricks in each) so the drawers don’t tilt down. * Fill with dirt and plant away. Her bustier is filled with herbs and her swing skirt with geraniums. Want to see what my 4 co-hosts of The Great Outdoors link party are up to? And Andrea of The Cottage Market. Update: Here’s what she looks like all filled in! i have to find a dresser–this is too cute! Very cute! I’m finishing my project this weekend. How cute Kelly! Love the color too. Have a great weekend. That is a great idea and a great color! I would love to have something to contribute to the party, but the weather has been miserable for the last week and now they’re calling for SNOW! I have a vintage, square pedestal sink I planted in the backyard and have been waiting to fill it with flowers. At this rate, maybe July? The bricks in the back of the drawers? Brilliant! This might just be my favorite project of yours. Love this….saw it done at a store on vacation last year ~ but love your dresser better 🙂 Lovely!! cute! i love the watering can, too! So are we sisters from another mister or what? 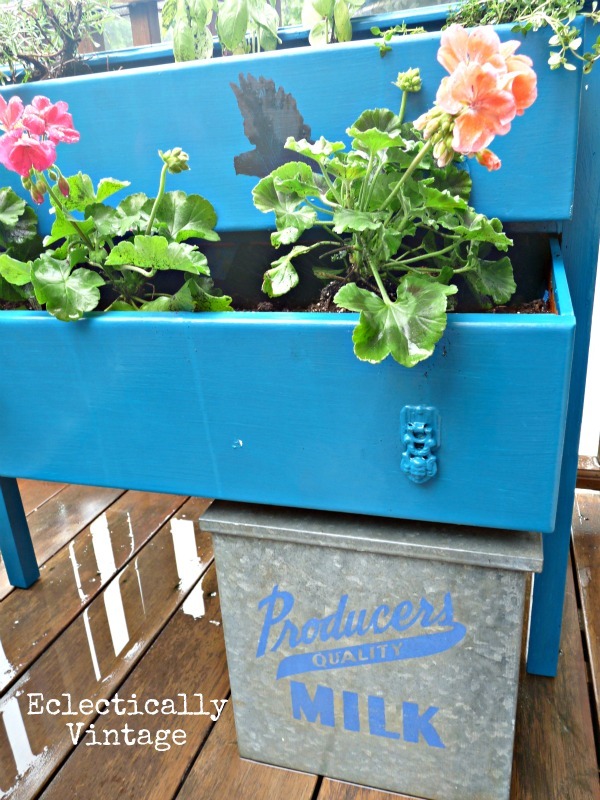 I just posted my $5 thrifted dresser planter yesterday too….getting ready for the great outdoors party myself. I do love that dresser with the long legs! and the blue is awsome. and actually the dresser only cost $4! Oh Wow!! She IS ready to party!!! I love her dress! Kelly!!!! I am so proud. I feel like I had a little teeny hand in this. But then my pride runneth over a bit too much. This is so cute, and I love the way you gave it so much personality. I would have never thought to put the bricks in the back so the drawers wouldn’t fall out. That is a genius tip. I am gearing up to clean up my side patio so it is picture worthy for you the big link up party. Happy Memorial Day weekend! Seriously Kelly! This is incredible! Love, love, love it!! Oh wow! I love your dresser turned planter. Wunderbar! The color is fabulous! I spiffed up our front porch just in time for the big party. I’m so excited! 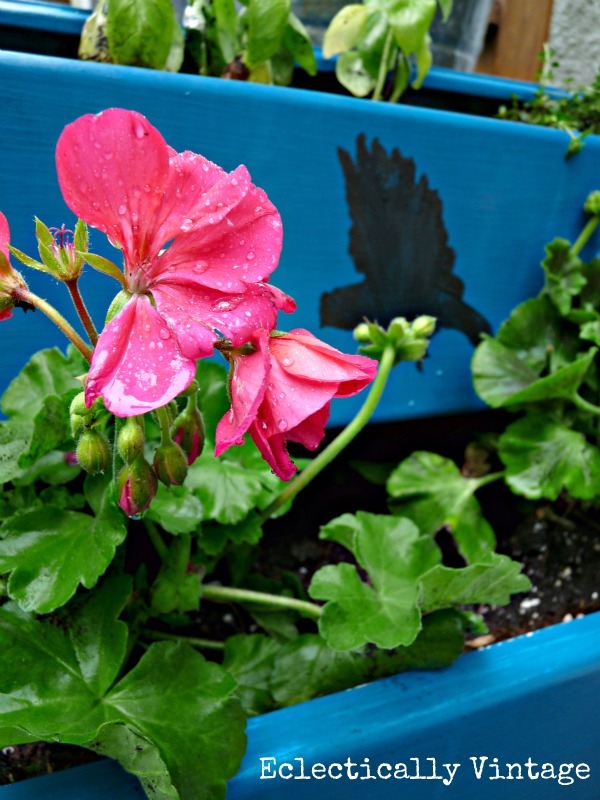 Well I love gardening and I love painting furniture – sounds like the perfect project to me! Really, really cute! What a fantastic idea Kelly! I would have never thought of that. She sure is a beauty! gasp! that is so freakin’ adorable!!! I wonder if my hubby would let me get away with it, or if he would think I’m crazy!!! Thanks for the beautiful idea!! What an amazing transformation! Are you available as an imagination donor? Oh I like that idea! Imaginations for sale!! 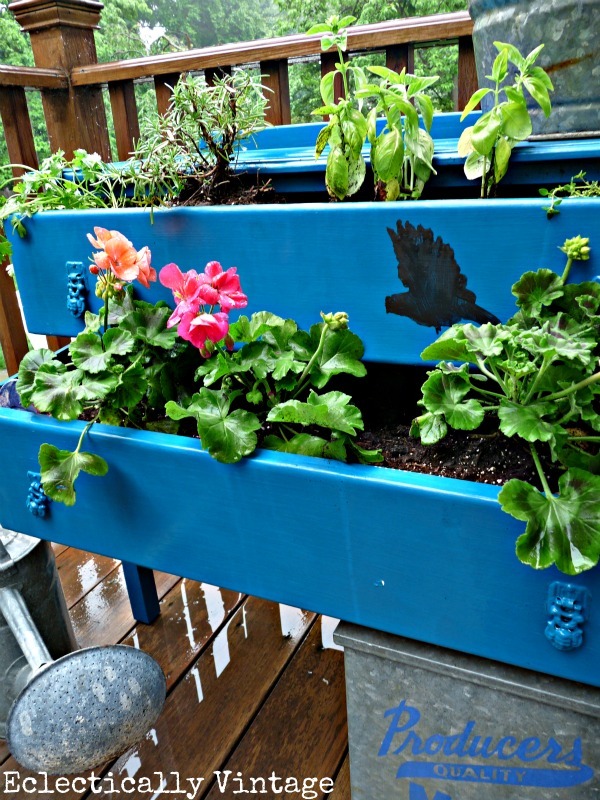 What a fabulous idea – love the color, too! Looks like we were on the same wavelength this week! Yours turned out great. Love it! Did someone say SNOW! It is so oppressive hot here in Carolina that unless you get to working at six in the morning, your projects don’t dry and the plants wilt. Now there is a tropical storm coming – I really want that for the rain we need. Whine, whine, whine… I need to finish something. Miss Peacock Dresser is strutting her stuff. I love the matching milk box! By the way, how did it get to the end of May so soon? Thanks for stopping to leave a fun comment at Quirky Vistas about my plant dresser. My little guy is still on probation and I’m keeping the rascal away from the girls until he proves he’s rehabilitated! I think he’ll be a fine and upright match for your little lady one day. And my goodness, she’s quite the eye candy, and probably has a beautiful aroma with those herbs planted in her bustier. If the sandlot rascal saw her he’d be head over bedside table legs. Loved your description of her. So cute! Ooops, you said long lost twin. I read, “get them together” and went off on a tangent. Ha! Yes, as twins, they should get together for sure! Very very cute! I love the little bird you added. She looks like she’s landing on the geraniums. Wow! You have inspired me. Love the color of the dresser. OMG is that ever cute and charming and a great score! Plus I love your paint color! Another great one- the color is A-MayZing!! Awesome! Love the color and the idea!! You really know how to dress a dresser! Love this! And that blue is absolutely gorgeous! Now I want to find something that needs a coat (or three) of Peacock Blue. It called to me – I only bought that color and loved it! What are the odds?! Holy Cow…this is so awesome, I could just spit. Doon’tchaknow I am on the lookout for a dresser now. So sorry, but you have become my #1 Project Hero and i aim to stalk you until I can stalk no longer. I foolishly didn’t know about this party so I can’t play today….but maybe next time. Very cute and I love that you painted the drawer pulls the same color. 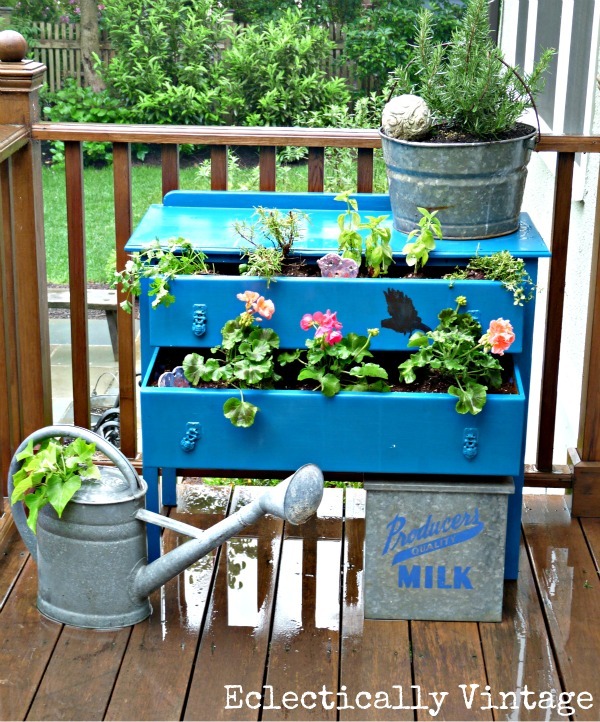 great dresser planter, i featured one similar to yours this week, love it! 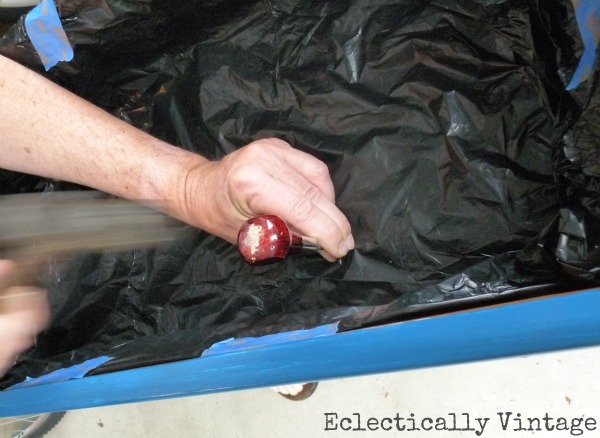 I was wondering how you kept the wood from going soggy – plastic! [email protected] A Pile of Scrap! This is such a pretty color and thanks for the tips on how to make my own! I’ve been on the lookout for the right piece to use. This is a good manageable size! Too cute, love it! I would love for you to share this (and any other creations) at Pin It and Win It Wednesday @ http://www.cheapcraftymama.com– where you can win free ad-space on my blog! This is just darling! I love the color, the bird silhouette, the flowers and herbs, everything! A great tutorial, too. 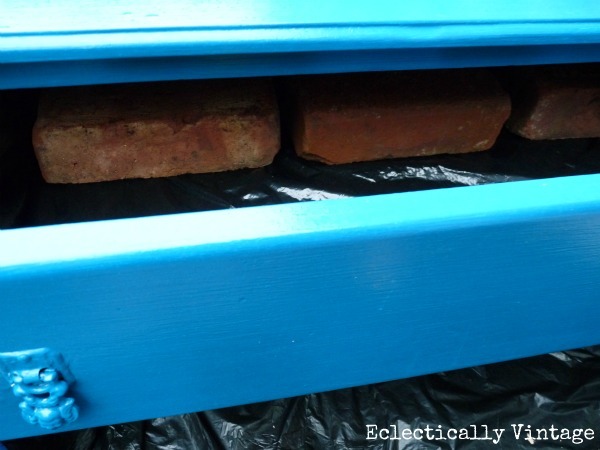 I’d never have thought to put bricks in the back of the drawers. Really spectacular! Such a cute idea. I know about bad hair days- we have had a lot of wind and rain and it doesn’t do much for the look! This is so cheerful and creative! The bricks for ballast is a great idea — filing that one away. I am telling you now you just got a STICKER! Kelly, I love this. I love the color and the whole idea. Thanks for sharing at Wow. Wow! This is such a cool idea! Love the color, too! Oh my god that is just FABULOUS! What an awesome idea, and that color is perfect! I really wish I had a deck so I could do this, but right now my plants are confined to little pots in a windowsill 🙁 I have a brand new link party going on right now and I’d be thrilled if you’d share this over there so everyone else can marvel at it too! Ok…crazy creative Kelly!! Love the colors!! 🙂 thanks for sharing at Uncommon! What a great idea!! Such a pretty pop of blue, too. I’ve pinned this and just shared on FB! Thanks for the inspiration!! I love it! Thanks for linking up 🙂 I pinned it! 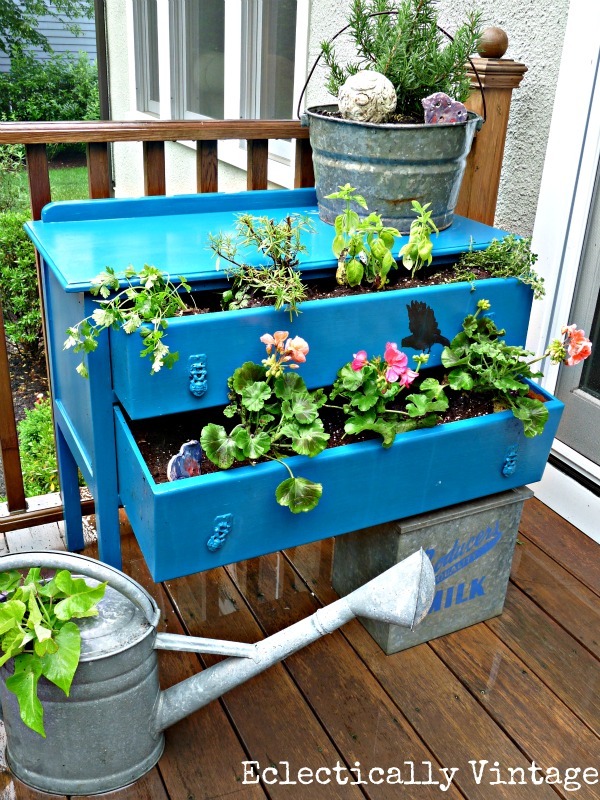 Love the blue and the idea of using a dresser as a planter. I think I saw this through Karah or Linda, and love it more still! Thanks so much for linking up and linking back. Good luck and feel free to follow us on facebook for all the contest updates! This dresser is so cute. How inventive! How adorable! The vivid blues are wonderful, a truly unique project. 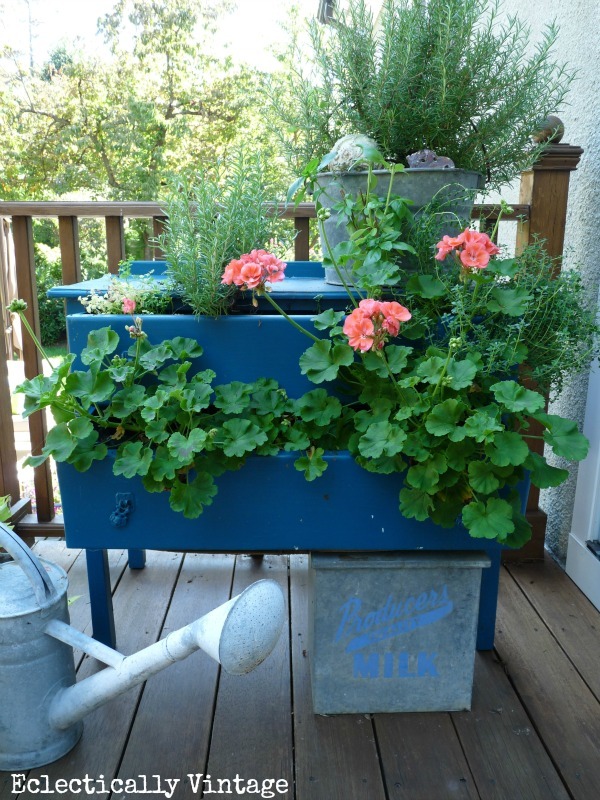 love the dresser’planter idea- But l feel so sad for the woman who posted that she wonders if her “hubby would let her get away with it.” WHO is he to judge what she wants to do in her home in her spare time…. wake up, sweetheart- life it too short to give it away to some jerk you happened to marry. It’d YOUR LIFE, not his! This looks great. I bought an old dresser today I’d like to do this to. How long did the dresser last? I asked a friend who said it couldn’t be done 🙁 Doesn’t matter, I’m going to try anyways! The dresser was out in the elements all year – snow, rain – so it only made it one year. If you bring it inside or have a sheltered area, I’m sure it would last longer. Enjoy!